Is the Rebel Alliance About to Take Down the EU Empire? Lega party supporters during a protest against European Union officials at Piazza del Popolo on December 08, 2018 in Rome, Italy. The EU is under attack from a Continent-wide band of rebels. 2019 could be the year they take power. Rebels are springing up all across the European Union. After 10 weeks, the “yellow vest” protesters are still coming out onto the streets of France by the tens of thousands. Small groups of “yellow vest” protesters are also springing up in Germany. In Spain, the new far-right party Vox has struck a deal with mainstream parties to occupy seats in the government of Andalusia, the first time this has happened in the nation’s democratic history. In Germany, the disruptive, right-wing Alternative für Deutschland is making waves, and headlines, almost daily. In Italy, the rebels are part of the government, where the two parts, Lega and the Five Star, have already engaged the EU in a high-stakes battle over their spending plans. And in Sweden, the Sweden Democrats did so well that it took the mainstream parties four months to figure out how to form a government without them. This is just the slimmest of overviews. Every nation has its own rebels—upstart parties at odds with the status quo. But in Europe, the rebels have been surging, and this year, they could break into the EU’s government. “The EU is bracing for its biggest political earthquake since the migrant crisis as hundreds of millions prepare to turn out to vote in European elections this May,” wrote the Times. Current polls indicate the traditional mainstream parties will barely win a majority in European Parliament. Once these new parties come to town, Brussels will look and sound very different. If they perform slightly better than expected, they’ll be coming in to take over. “This year will be the one when populists gain real power on Europe’s largest stage, eroding the EU from within,” said Mij Rahman, managing director for analysis on Europe at Eurasia Group. What will this radical new Europe look like? Early this month, two of the most important European rebel parties gave us a glimpse. What do these pro-X, anti-Y and anti-Z parties want? There is a lot of misunderstanding. In the press, they’re commonly referred to as “euroskeptic” parties—as if they’re a European version of Britain’s United Kingdom Independence Party (ukip). This is not true. The connected expansion of military and policing operations across North Africa and the Sahel designed to choke off the African migration routes to Europe has increasingly attracted the support of European right-wing populists who share a penchant for military solutions to social problems. Rather than dismantle the EU, far-right populists could help accelerate the militarization of the EU in order to project collective power into states along the EU’s borders in a quasi-imperial fashion. A quasi-imperial fashion—that’s certainly not less EU. There’s a lot that these upstart parties hate about the EU. They don’t like migration. They don’t like globalism. They don’t like bureaucrats meddling in their lives. They believe environmentalist regulations are destroying their economies. They don’t like Europe’s embrace of secularism. But all this is very different from an ideological rejection of the EU itself. Britain’s ukip fundamentally objects to the UK being in the EU. The European parties strongly disagree with the direction the EU is heading in. They dislike the Brussels bureaucrats who are currently in control. But change direction, and leadership, and they would have no fundamental problem with the EU’s existence. 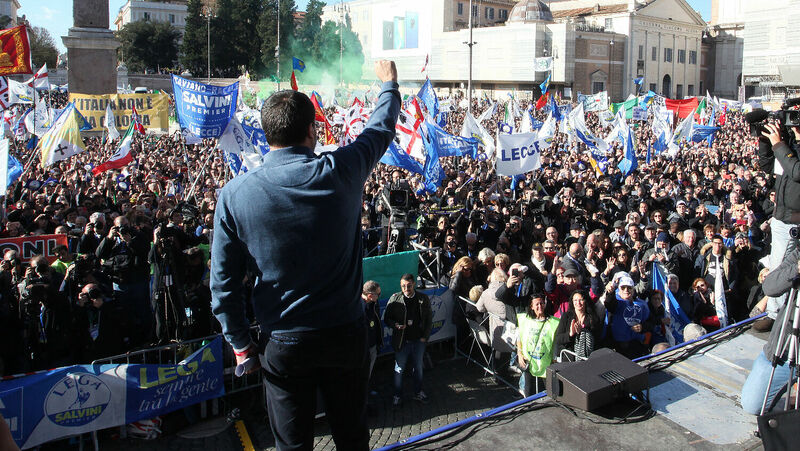 “Europe must return to its identity, to its Judeo-Christian roots—which is … rejected in Brussels in a crazy way, where family values are rejected,” said Salvini. With the European parliamentary election approaching, expect to hear this type of rhetoric emerging more and more from Europe. These upstart parties disagree on a lot. But the vision of a muscular, Christian Europe unites them—and the parliamentary election gives them a great opportunity to push for that vision. The Trumpet and its predecessor, the Plain Truth, have been watching for this development since the 1930s. For decades, Plain Truth editor in chief Herbert W. Armstrong forecast that Europe would unite into a 10-nation superpower. But most of the Continent’s history has been one of infighting. What force is strong enough to bind Europe together? Mr. Armstrong forecast a common currency in Europe. In the November-December 1954 Plain Truth, he wrote, “Germany inevitably [will] emerge as the leader of a united Europe”—a sentiment many in Southern Europe would agree with today. The September 1967 Plain Truth declared, “[O]ne thing you can count on. In fact it is so sure you can bank on it: The cry of a political union in Europe will get louder.” In April 1952, the Good News stated, “Russia may give East Germany back to the Germans and will be forced to relinquish her control over Hungary, Czechoslovakia and parts of Austria” in order to complete this union. So much of this has already happened. Mr. Armstrong’s forecasts, based on Bible prophecy, have proved accurate. Yet full union has not yet been achieved. Why? “In only one way can this resurrected Holy Roman Empire be brought to fruition,” Mr. Armstrong wrote, “by the ‘good offices’ of the Vatican, uniting church and state once again, with the Vatican astride and ruling …” (Plain Truth, January 1979). The one ingredient still missing for European unity is Catholicism. These forecasts are based on Bible prophecy. Revelation 17 describes a “beast”—biblical symbolism for an empire (or a power operating in a “quasi-imperial fashion,” to use more modern jargon). It is ridden by a woman, or a church. The European vision of the populists is very similar to the Europe prophesied in the Bible. But Revelation 17 gives us more important details about this power. It consists of “ten kings,” 10 nations or groups of nations. “[I]t may very well be that there’s those 27 nations in Europe, called the European Union, [which] are going to be reduced to 10 nations, or 10 kings, probably in 2019, as well,” he said. This new Europe will be here very soon. And as these upstart parties coordinate their vision for new Europe, we may be watching its arrival. There has never been a better time to learn about this rising European power. Mr. Armstrong’s book Who or What Is the Prophetic Beast? will help you understand what is happening in Europe. It will clearly explain the prophecies of your Bible, such as Revelation 17, and show you what they mean and why they apply to modern Europe. These prophecies will give you hope in a world full of bad news. It shows that all this news is not just random, chaotic events. Instead, world events are unfolding according to a definite, heavenly plan. You can read Who or What Is the Prophetic Beast? online or request a free print copy, delivered at no cost, and with no follow-up or obligation.